Kakinada Army Recruitment Rally Soldier Nursing Assistant Computer Based Examination Test (CBET) Date. 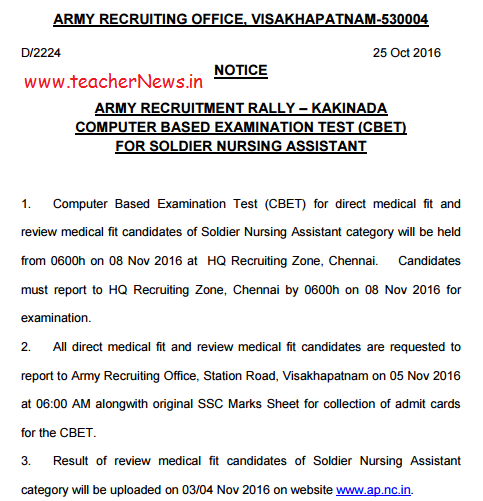 Kakinada Army Recruitment CBET for direct medical fit and review medical fit candidates of Soldier Nursing Assistant category will be held from 0600h on 08 Nov 2016. 1. Computer Based Examination Test (CBET) for direct medical fit and review medical fit candidates of Soldier Nursing Assistant category will be held from 0600h on 08 Nov 2016 at HQ Recruiting Zone, Chennai. Candidates must report to HQ Recruiting Zone, Chennai by 0600h on 08 Nov 2016 for examination. 2. All direct medical fit and review medical fit candidates are requested to report to Army Recruiting Office, Station Road, Visakhapatnam on 05 Nov 2016 at 06:00 AM along with original SSC Marks Sheet for collection of admit cards for the CBET. 3. Result of review medical fit candidates of Soldier Nursing Assistant category will be uploaded on 03/04 Nov 2016 on website www.ap.nc.in. Army Recruitment Is Free Of Cost. Do Not Pay Any One For It. Unfair Means Of Enrolment Will Render You Liable For Action Under Law. Have Faith On Yourself.